Or possibly a wheelchair. Before I go any further, I must tell you that however much to the contrary it may seem, I really, truly loved a very large number of the minutes we spent going up and down mountains in the pouring rain. This may read like a litany of awful experiences but quite often, it was the view, not the height, which took my breath away. We walked more miles and climbed more hills this week than I would normally do in a month. It was undoubtedly very good for me and character forming to boot. I thank the heavens for good boots! We arrived in Cumbria of the English lakes, clutching our Wainright* book, on a sunny Sunday morning. We wandered Ambleside and bought a pair of matching gilet fleece thingies in a sale. We decided to do a short easy walk up a very small mountain. The view was splendiferous and there was a jackdaw touting his bright silver stare and gleaming feathers in hopes of getting a bit of left over tourist lunch. After a while, and after a few photos, my legs agreed that it was worth attempting to walk the longer way back. Near the lower end of the walk back, the road went down steeply and one of my knees suddenly hurt a lot. I walked the rest of the way down crabwise. 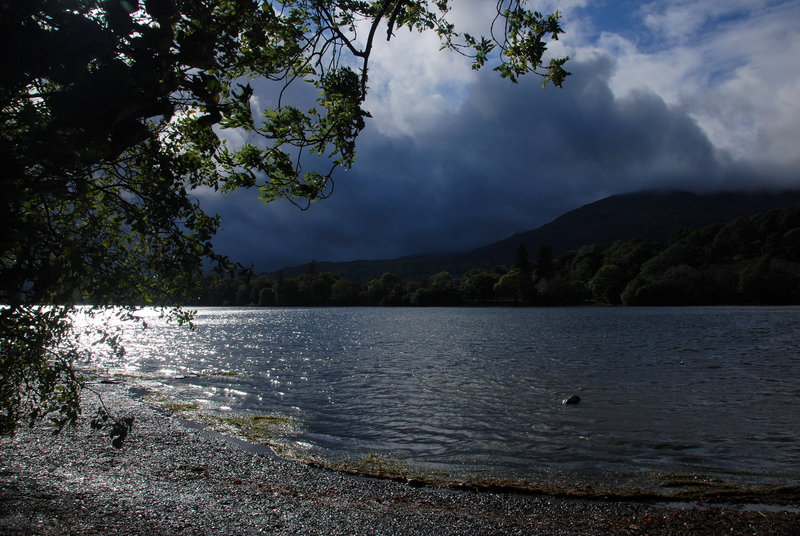 Next morning, the sun did not shine but rain fell steadily from stormy skies so we went to Keswick and walked wetly around it. Also we went to a pencil museum (which was actually very interesting indeed). 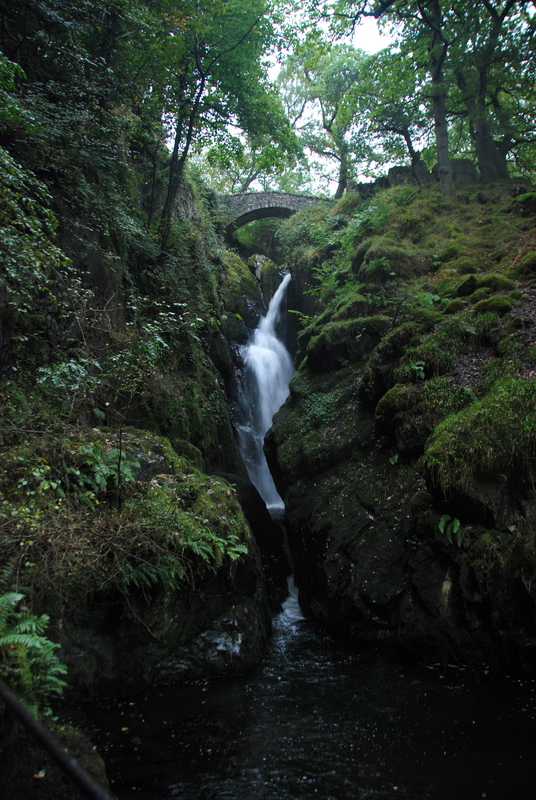 Then the skies cleared, just enough that we thought we might do another, even easier, walk up to see Aire Force – a beautiful waterfall in the woods. Up being the operative part. 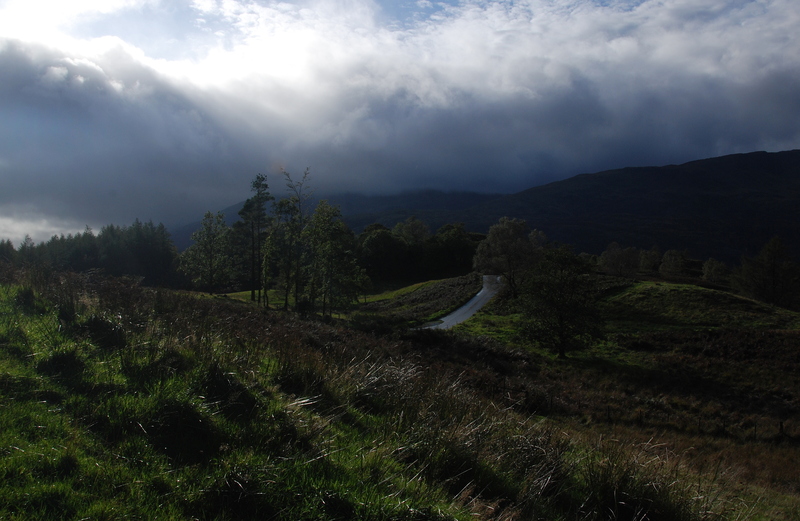 And we were wrong about the rain, it returned and lent the woods and boulders a splendidly gloomy and doomladen air. After passing a number of cateracts, plunging into dark ravines we decided that we might just possibly have missed the hole in the wall through which we had intended to walk round the fells above to get the most impressive views of Ullswater, shrouded in mist. We made our way back down through the twisty forest and had a wonderful cream tea in the cafe. Then returned, as the evening sun came out and gleamed brightly on all the wet leaves and rocks and crags, to our B&B and our enormous bed. I love extra large beds! Where we lay stranded like wet fish until we had enough energy to shower and go out for dinner. As it wasn’t yet time to collapse completely, we went on to Tarn Hows to view the picture book lake and I got to wander off in the sun and take pictures all by myself while Barney sat in the car and read Wainright. (Plotting my next near downfall!) 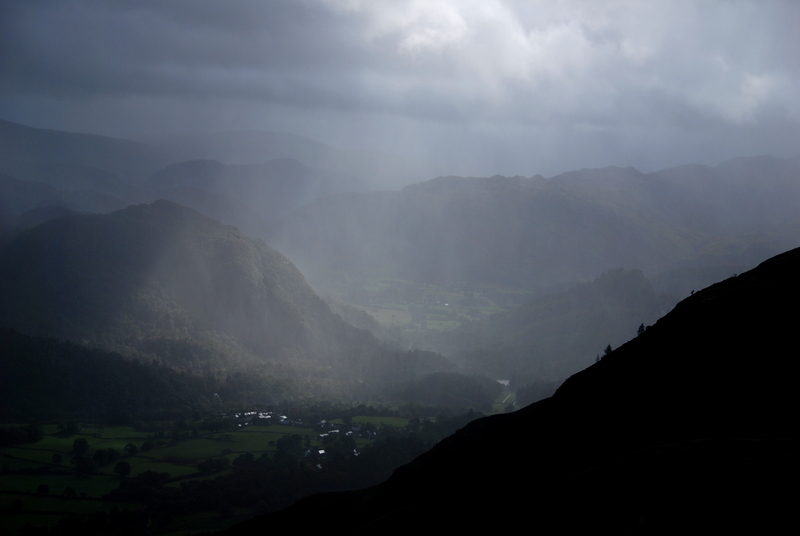 Rain swept in white gusts across the distant Fells and the sun illuminated it. 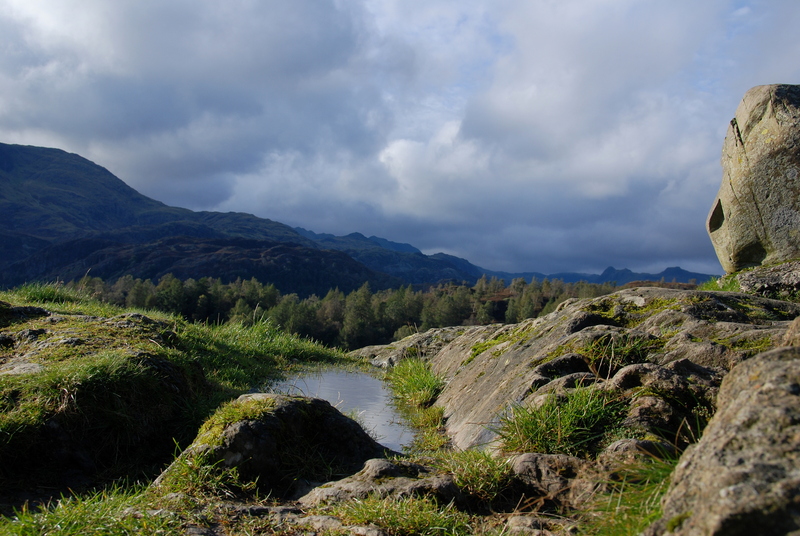 I found a small crag of my very own (a very small one, about ten feet high) with a puddle in the middle of it. 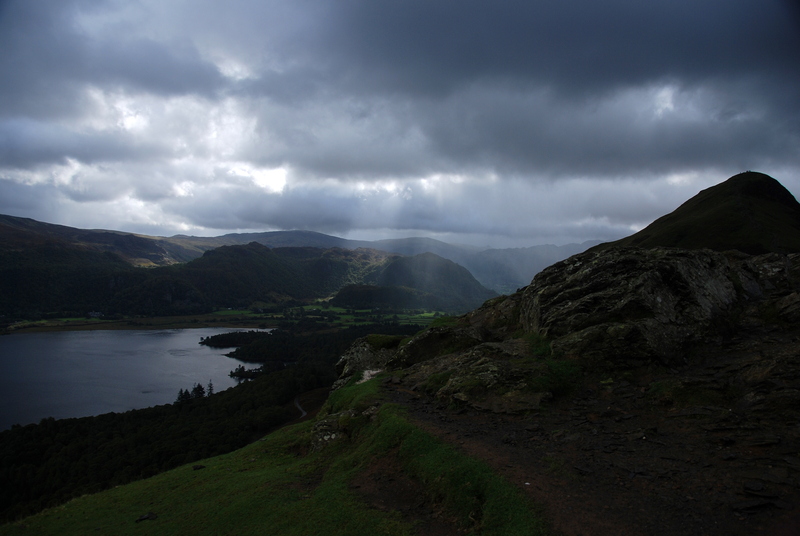 The next day, the sun and rain alternated but as we drove fellwards, the skies ahead suggested that it might be worth attempting our first real, serious climb, up Catbells with views over Derwent Water and a pleasant walk back along the lakeside through Manesty Woods. Wainright said this walk would be enjoyed by children and grandmothers as well as more serious walkers. As I expected, the climb was steep. So after a few feet I was impressively out of breath and my legs were completely jelly. But it was all just a question of taking a bit longer, I thought, remembering the children and Grannies who had enjoyed this ‘walk’. Until I got halfway up a steep, rocky outcrop and realised that I was poised above a drop on either side of a narrow selection of footholds – all of which the jellyness of my legs wouldn’t allow me to reach. The moment of acute panic wasn’t so much about the immediate fear of inadvertant flying (bad enough I assure you) but about the realisation that I had already gone too far to turn back. There was absolutely no way in a million years that I could ever ever ever do this bit in reverse. They would just have to send the helicopters in to lift me off. And what the hell kind of grannies and children enjoyed this walk, I wondered furiously? The thought of the grannies spurred me on (and the five minutes of frozen panic gave my legs a rest and me time to get my breath back) so I made it over the rest of the rocky bit to the first ‘little’ peak. And got the first eyeful of the main peak which was not at all near but very very high above and very very thin!!! Oh No. Oh dear me no!!!! There’s no way I can go all the way up there I decided. There has to be an easy way down from here where I can sit by the roadside and wait for Barney to get the car and rescue me. For some reason I didn’t say any of this apart from a sort of breathlessly feeble squeak. This caused Barney to say kindly, no hurry, take your time, have some coffee. It’s not far now, the views will be even better up there. Which reminded me that I ought to be taking photos. This revived me a bit (it’s amazing how taking a photo does revive me) and we staggered onward and upward. Quite a lot (of staggering and upwardsness). The thin bit was wider than it looked from a long way down and the top was wide enough to walk about on in a wobbly sort of way and – Oh, I forgot the gusts of wind and sudden sidewayspours of rain and occasional bursts of blinding, full frontal sunlight that accompanied us up, like teasing, mischievious and not altogether friendly goblins (or boggarts as they used to be called in the North) – anyway, the view was worth all of the climb, every bit of it, and distant rain marched across the peaks and valleys and the sun and the clouds all did their thing again. I shall leave you here, wet, aching and simply dying to know what heroic feats we next achieved, though, in fact, Catbells, at four and a half miles, nearly finished this Granny off completely and I refused to even contemplate Haystacks and Buttermere (seven and a half miles). Frustrating for Barney of course but I think he realised that the only way we’d both get up Haystacks would be with me riding piggyback 🙂 I did encourage him to do it without me but he didn’t seem keen. I don’t know why. *For those of you who don’t know of him, AW Wainwright, wrote wonderful walkers guides for the Lake District fells, illustrated with maps and sketches and full of marvellous detailed information. They may have been the first pocket sized walkers guides.